« Older: Now Available: Croc Pops!! 1. Both children must be alive and in the custody of either the Belize Police Department or the children’s family. 2. The reward will not be paid unless both children are recovered alive. There will be no partial reward for the return of just one child. 3. 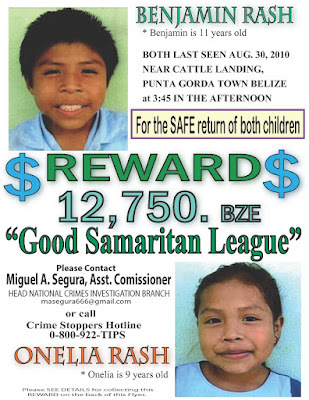 The reward will not be paid before the children are in the custody of the Belize Police Department or the children’s family. There will be no advance payment of any kind, including (but not limited) to “out-of-pocket expenses,” “facilitation fees,” “locator’s fees,” etc. 4. The reward will be paid to anyone who is aware of the location of the children if he or she provides this information to the Police, and the information leads to the safe recovery of both children. In order to collect the reward, the person providing this information must be able to confirm that they were the ones who provided the information. 5. If more than one person is responsible for the safe recovery of both children, the reward will be split between those persons. In no case will the total reward paid exceed BZ$12,750.00 (Twelve thousand, Seven Hundred, Fifty Belize dollars). 6. If the children are safely returned, and there is a dispute between persons attempting to claim the reward, the Belize Police Department will decide who the reward shall be paid to. The decision of the Belize Police Department will be final.